For as much as the contributors of this site enjoy making lists about movies, very infrequently do we venture outside of our regularly scheduled Top 5 Movie Guides. It generally takes something significant to warrant such divergence, but that's exactly what we're doing today. It's taken some time to get this post together, so at this point it's no secret that Roger Ebert tragically passed away earlier this month, leaving an entire community of film enthusiasts distraught. It goes without saying that everyone at this site sends our condolences to Mr. Ebert's family and friends, and his absence with be greatly missed. Even though Mr. Ebert was an avid non-listmaker, creating exactly that is the best and only way that this site knows how to honor the late, great critic. So today, we take a look at Roger Ebert's extensive list of "Great Movies" - consisting of more than 300 titles - and each rank our ten favorites from that group. Mr. Ebert has compiled the list over the years, citing "considerations and appreciations of movies from the distant past to the recent past, all of movies that I consider worthy of being called 'great'." The grouping spans almost the entire spectrum of film's existence, and covers every genre and category you could imagine. Picking out only ten films from this group - and then ranking them! - was incredibly tedious. Nonetheless, we hope that this exercise is a worthy final remembrance to Roger Ebert, and maybe you'll even find some value in our selections. There were a million ways I could go with this list, so take it for what you will. In a previous post I commented on how this is one of my absolute favorite movies of all time. It's a perfect blend on entertainment and technical mastery. Indiana Jones is my hero. I can't deny the impact this film has had on my life to this point. I will always appreciate this film, and can probably say it's my most-watched film on this list. Every time this film comes up, I realize that I have a stronger love for it than I did before. It's just a great film, and I really enjoy Jimmy Stewart's work in it. My mom always made us watch this on Christmas Eve when we were younger - I barely cared at the time, but now I'm glad I'm so familiar with it. I'll make my kids watch this every year on Christmas, too. Great sci-fi thriller. I love Ridley Scott's intricate style, and of course the imagery of the creature is amazing. I can never decide if I enjoy more of the horror angle in this film or the action angle in the sequel. Both are great, though. Let's keep the alien theme going. This is a much more grounded and emotional take on the genre, but it has to be considered a masterpiece. I've always liked the film, but only in a recent re-watch did I see that even as an adult the film was still impactful. This is another film that I've long appreciated, but only recently have really grown to love. I've always enjoyed the imagery and the pace of the film - and of course the music is just spot-on - but only after watching the recent documentary "Room 237" have I expanded my appreciation for Stanley Kubrick. I've since studied up on him, and I love just how intricate he was with every aspect of his films. This film has just come on like a storm with me. I've seen it only three times in my life, but every time it's gotten exponentially better. My first viewing, as a young lad, left me less than impressed - it was a slow black & white movie; I didn't really care. My second viewing, for a college film class, made me appreciate the film for the first time and understand its importance in cinema history. The third time I watched it, within the last two years, it just clicked into place. It will probably never be on my all-time Top 10 or anything, but I just loved the pace and the story it told. Maybe it took an adult to better connect with the story, but whatever the reason, this film finally means something to me, more than just on a technical level. What's interesting here is this film actually does have a chance to possibly be on my Top 10 someday (it's a fringe candidate currently). Great pace, great characters, great story. It's a near perfect film. Maybe I'm currently just a bit more excited about each of the films above. Let's make it three Steven Spielberg films on this list (plus it sort of brings another Kubrick film into the picture, too - Spielberg says that he never felt like he was directing his own movie with this one). I love the art direction of this film, and there's a great eeriness present throughout, as well. I kind of went with a flier in the #10 spot and selected a comedy. I don't normally have much interest in comedies, but this is definitely one of my favorites, and I thought the genre deserved a place on this list. I prefer Kubrick's interpretation to the actual novel. Visually immersive and dripping with tension. Scorsese has a knack for portraying delusional characters in an almost relatable light. Aside from the dimensional portal acid trip sequence, this film isn't dated at all. Unforgettable characters. This is comedy gold. I've seen this too many times, but it never gets old. It may not seem like it on the surface, but it has a haunting quality. The characters really stick with you. A surreal look into the artistic process, and the internal conflicts arising from professional obligations and human desire. Far from a perfect film, but keeps getting better with age. Kubrick's style may be too emotionless/distant for this material and Spielberg really brings it home. Though, one can't help but wonder what could have been. One of the best fantasy films of all time. Emotionally jarring and unforgettable. Sometimes when I'm watching other movies I'll think, I'd much rather be watching 'Star Wars'. That reoccurring thought is enough to place this movie atop my list. Every kid goes through that shark obsession phase in their life, right? This is what fueled mine. A Thanksgiving staple for my family. And when it's not Thanksgiving, we watch it anyway. I like to think he lived the same day for about 10,000 years. I want this to happen to me so so badly. Though, I would like to be able to choose the day I relive over and over. Maybe choose five days to sample, live those days out for a month each, and then pick my favorite one to live out for 10,000 years. I don't watch this movie very often anymore, but its significance is undeniable. A near perfect film, if not perfect. It's difficult to be definitive when talking about Hitchcock, but I believe this is my favorite Hitchcock film. Amazing and highly memorable art direction. I want to say this is Sci-Fi Horror at its best! I've tried multiple times to include this in my Top 10 Movies of All Time, so it surprises me that it's ranking so low today on this list. I think it's because of how serious this film gets at times, when all I really want it to be is epic music and dancing. Those are the parts you want to walk away remembering anyway. Maybe this is in bad taste, and I don't know how he went about compiling this list, but the fact that 'The Lord of the Rings' is not present is regrettable. In my Top 10 favorite films, and one of the greatest films ever made. I've said it every time I've referenced this movie, but I think it's the greatest all-around film ever made. I just watched this movie again recently and it's such a powerfully acted film. Nurse Ratched is one of the most evil people in the history of film. One of my favorite comedies. As I made my way through AFI's Top 100 list this might have been the biggest surprise out of the whole thing. The Marx Bros. truly were comedic geniuses. I laughed throughout the entire film. Even though I don't really tear up when I watch this film (at least not that I remember), I list this as the saddest movie I've ever seen. Another one of my all-time favorite comedies. What makes it so effective is how close it really is to showing the rock & roll lifestyle at the time, and how these guys acted. I just watched this recently and it's so much darker than I remembered. I can see how I wasn't into this film as much as a kid, but watching it as an adult, I have a new appreciation for it. I have trouble describing this film. I guess the way I like to describe it best is to say it's a powerhouse of a film. There is only a small handful of films I say that about. What I mean by that is, when I'm watching it, I feel like I'm doing something important, not just sitting around watching a movie. My favorite western on Roger Ebert's list, and one of my all time favorites. This film features one of the most epic shootouts in all of film. Was this the hardest list of all time to narrow down? There were at least thirty movies that I loved! Honestly, the following ten movies are some of my favorites of all time. 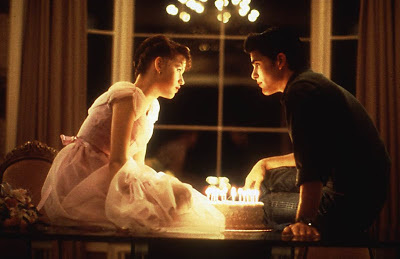 I’m scared to think about the kind of person that I'd be if this wasn't my very first most-watched and favorite movie. An epic counterculture film that speaks volumes about American society in the late sixties. This movie has so many amazing elements, and it’s a journey that probably couldn't happen now, but you sorta wish it still could. It makes me wish I was riding around the country with those guys. I've said before that this is in contention to be one of my favorites of all time. Its visuals, tone, and its creepy sci-fi nature is right up my alley. This is how a tension filled sci-fi movie should be. There’s only one alien, and a lot of the movie is pretty quiet. The way that this movie builds tension between its crew and as the creature starts picking people off and rapidly evolving is masterful. I am basically anti-horror film, only because I’m too sensitive and scared. This one though, might be my favorite. It's not mindless gore and frights just for the sake of frights without a storyline. The story is involved and intriguing, the acting is great. I love a thriller with a great story. The only thing that stops me from watching this movie more is the scary ending! I am scared for George Bailey every time and the ending makes me feel so happy. The perfect Christmas movie. I love the quaint old town setting and the fantastical elements. This was my introduction to Jimmy Stewart, and I've always loved that his characters somehow seem both realistic, familiar, and yet untouchable in an indescribable way. This little alien doesn't seem like he should be endearing by looking at him, but you can’t help but love him and his human family. Just try not to laugh and cry! This movie is very important to me. If it wasn't for James Dean and this movie, I don't think I would love movies and the acting world as much as I do today. My interest in this film and the young actors in it should be at the center of a “Tracy Allison” Venn diagram. Romances can follow a fairly typical formula and I love the fact that this one doesn't The people are flawed, just like real people, and that makes it more endearing to me personally. Unlike tradition Top 5 Movie Guides, we're not going to provide stats for all the films above. There are 50 slots above, and each of these lists should stand on their own. There were some films that were definitely more favored than others - interestingly though, not one film appeared on all five lists - but overall, there was fantastic variety (33 different films overall) that really showcased the depth of some of the movies Roger Ebert considered Great. Roger Ebert had a major impact on cinema, and there is no doubt his contributions will be forever remembered. We send a final Thank You from our entire staff to Mr. Ebert for all that he did over the course of his lifetime to help advance the art of film. What you do with the information above is up to you, but if you're looking for some great films to dive into that resonate equally with one of the greatest film critics of all time and a handful of Slackers, these should be fine options. I'm glad "It's A Wonderful Life" and "Silence of the Lambs" made it onto peoples lists. Those were my last two I left off my list. I had trouble leaving off Groundhog Day and Psycho, myself. And about fifteen others, haha.